This is a very sad day for me and my wife Ali. Our beloved cat, Ben, passed away quietly in his sleep last night. He was nearly 18 years old so he was a bit of an old timer. We are pleased that he passed quickly and didn't suffer. 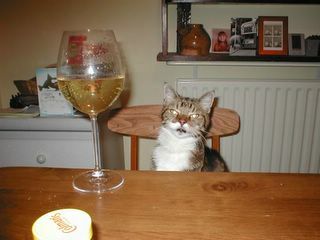 In fact he was sitting on my lap last night purring as we watched United beat Arsenal together. He could be a bit of a grouch sometimes and he did like a good moan when we wouldn't let him share our Sunday roast, but overall he was a happy, funny and good natured little fella and we will miss him very much. Tonight, we opened a bottle of Moet & Chandon Champagne and drank a toast to his memory. We then went through 18 years worth of photos finding all the pictures of Ben we had ever taken. It may seem like it would be a bit maudlin but in fact it was lovely to remember back to what a happy life he had led. So here are a few pictures of Ben from over the years, from when he was a tiny little sprout to just a few weeks ago. A couple of them feature his twin brother Oliver who passed away about 9 years ago. If you ever met Ben I hope they will trigger a happy memory or two and that if you find a spare moment, you too will lift a glass in his memory. Cheers Ben. Ben when he was just a couple of weeks old with his brothers and sister (he is second on the left and his brother Oliver is first on the left). 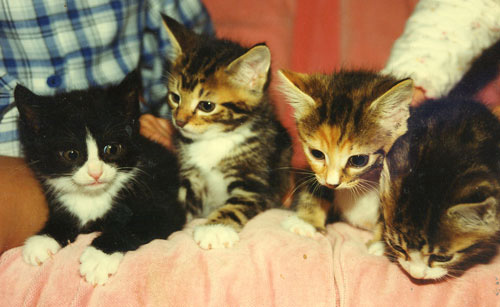 The family who's litter it was invited me round to pick which two of the kittens I wanted. I immediately said I wanted to take Ben and Oliver because they both seemed to be adventurous and also to be friends with each other. I was then told that this was a good choice because the other two kittens had already been promised to other people. So I guess it was fate. I was just 19 at the time and I really didn't expect to still be mates with him 18 years later. 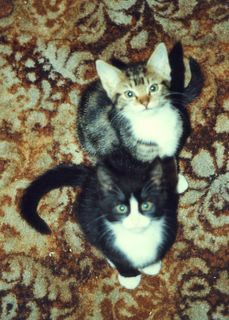 I actually officially adopted them a little while later when they were 10 weeks old. 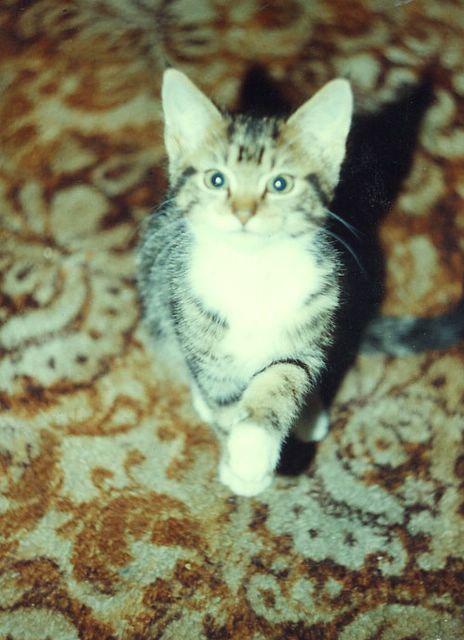 This is Ben when he was a kitten, about 4 months old. Whilst he slowed down a bit in later life as you would expect, his personality was pretty much the same then as it was yesterday. This is Ben with his bother Oliver about the same 4 months mark. Obviously kittens don't know how to pose for photographs so I assume they are looking up to avoid having to look at the hideous carpet that I had in my first flat in Hull. Since my flat was on the bottom floor I was able to put in a cat flap to give them access to the garden. I chose a rather fine example with a transparent door so that they could see what was outside before going out. However what they did was play tennis with the door, one sitting inside and the other sitting outside, until the door smashed off. So after that I just had a cat hole. Ben is about 12 years old here. By this stage his love of Whiskers and continuing begging for bits of our Sunday lunch had resulted in him being a bit of a fat lump. And don't think that Ali holding him is some sort of midget making him appear enormous. He really was that huge. p.s. A special thanks to my family who all got in touch to offer their virtual hugs. Ta very much. Big hugs to you and Ali. I've lost two mogs in the past, both to the road, but it was amazing how a little ball a fluff fills such a big part of your life. 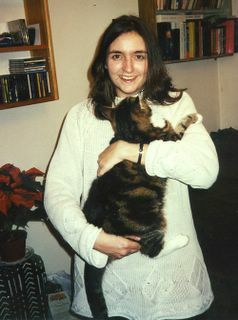 Ben was adorable, very affectionate and with a purr like a roadworker's drill. I'm very sorry to hear the news. Ben looks very lovely and a real cat character. I lost a dearly loved cat (Morris -14 yrs, He looked like your black and white cat) three weeks ago to a horrible slow fading anaemia. It has been such a blow And life will never be quite the same without him, he was so funny and clever. But a new kitten is arriving soon and he is called Ben so I idly googled Ben the cat - and found your nice piece . I hope my new friend has as long and happy a life as your Ben clearly had.